Every year or so Holly and I host a Greek-themed, springtime hootenany we call our Big Fat Greek Parties. We roast goats and lambs, eat octopus, sometimes grill sardines. But the mainstay of the party food is always this more or less traditional Greek loukaniko sausage. Loukaniko is an ancient sausage, dating back to Classical times. 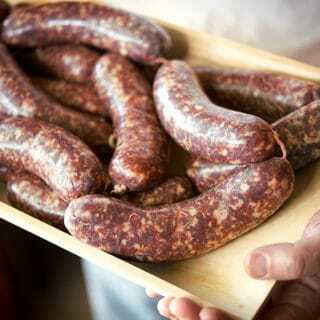 Nowadays it is a roughly ground Greek country sausage that, like any country sausage, has lots of variation depending on the region and the cook. The only constants I could find after researching these links is that they must include pork, garlic and citrus peel. Fennel is common, as are cinnamon and leeks. You’ll often see either white or red wine in the mix, too. The dominant flavors are usually the orange zest, garlic and coriander. You definitely taste the Mediterranean in this link. Many versions of loukaniko are mixtures of both pork and lamb. I don’t often have lamb in the house, but I do have venison as a stand-in, so my mixture is about two-thirds wild boar with one-third venison trimmings. You can alter that ratio as much as you want. Loukaniko is best cooked on a grill over an open fire. But you can use it in stews or cook it in a frying pan, too. Make sure everything you deal with — meat, liquids, equipment — is very cold, as in close to freezing. This really matters, not so much for sanitation, although that’s important, but for the final texture of your sausage. Warm ingredients won’t bind well. If you don’t have a sausage grinder and a sausage stuffer, I really don’t recommend you try this recipe. But if you must, you can pulse the meat in small batches in a food processor and stuff it through a wide funnel. You will need hog casings for this sausage, although I suppose if you kept kosher and wanted to skip the pork shoulder and use sheep casings, that’d work fine. Soak 5 to 6 lengths of hog casing (about 1o to 15 feet) in warm water for at least 30 minutes before you begin stuffing. You will need a rack to hang these links on while they are drying. A hand-wash drying rack works well. You may need string to tie off the links, if you need to hang them in a way that doesn’t allow your twisted links to stay twisted. Have this handy, along with scissors. You will also need a needle to prick your sausages once they are hanging — this is to release any trapped air. You will see air pockets on some of your sausages. Prick these with your needle. Sterilize it in the burner of your stovetop. Try not to eat them the same day. 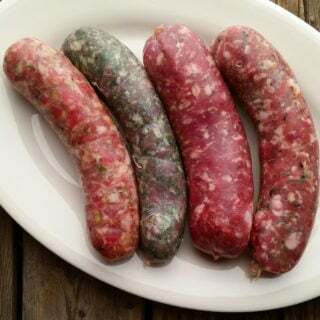 All sausages taste better the day after they have “cured” in the fridge overnight. These sausages will in fact cure a bit because of the Instacure, but even without it the link with firm up and hold its shape better after it rests. Many loukaniko recipes call for smoking the links, or at least drying them for a couple days. If you do this, add a pinch of Instacure No. 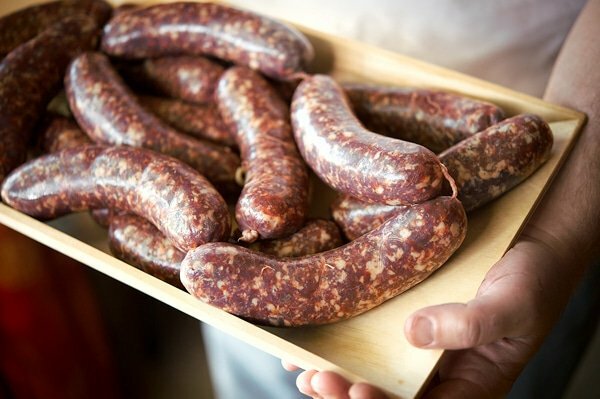 1, a nitrite that helps the flavor and protects the sausage from bacterial issues while it smokes at low temperatures: Typically I smoke several pounds of these links for several hours to an internal temperature of about 155ºF before finishing them with a kiss from the grill. Chop your pork and lamb into rough, 1-inch chunks. Mix in the salt, curing salt (if using) and sugar and grind through a coarse die on your grinder. Put this in the fridge overnight if possible or for at least an hour. The step helps the sausage bind to itself when you stuff it. Set aside 1/2 of the coriander, black pepper and fennel seeds in a small bowl. Soak your hog casings in warm water. Put the wine in the fridge. Make sure all your grinding gear is cold. Mix the remaining spices with the meat and fat and grind the meat a second time into a bowl. You can grind coarse again or go fine. Your choice. I do half-and-half. Set the bowl for the meat into another bowl full of ice if your room is warmer than 70ºF. Once it's ground, put the meat in the freezer and clean up. Get out your stand mixer and find the heavy paddle to it (not the dough hook). If you don’t have one, put the meat mixture in a large bin so you can mix it by hand. Add the orange zest, reserved spices and the wine and mix the sausage well for 2 minutes, or until it forms a sticky, cohesive paste. If you are doing this with your hands, they should ache from the cold. Get out your sausage stuffer, which if you’ve been smart has been living in your fridge or freezer for the past few hours. Fit it with the appropriate tube and stuff the sausage. Do it all at once before you twist it into links. To twist into links, start at one end and compress the meat into the casing, then tie off the casing. Measure out a good-sized link, then pinch with your fingers. Do the same another good-sized link down the coil. Once you have them both pinched, twist several times to tighten the link well. Repeat on down the line of the coil, then tie off the final link after compressing it, too. Once you’ve finished, hang the links so your twisting does not come undone, or tie off each link with string. Use the needle to prick any air pockets, and compress the meat in the casing to fill those pockets; be careful or you can rupture the casing if you do this too roughly. Hang your sausages to dry for about 2 hours in a normal room, only 1 hour if the room is warmer than 75ºF. Ideally, you hang the links overnight at about 40ºF. 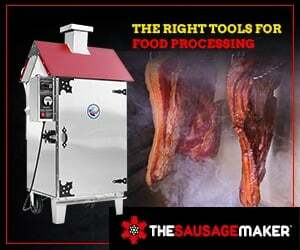 You can find all sorts of recipes for fresh and smoked sausages here on Hunter Angler Gardener Cook! I’m interest in making this recipe soon, but am not sure what type if wine works best for it. Any ideas? Thank you for all of your recipes! I’m getting your book soon. James: Ideally a red sweet wine. Other than that, any red wine. Is there anyplace I can buy/order a ready to grill Greek orange lukaniko? I would really like to know if there is any place that has it prepped for delivery?